Replenish and brighten with CeraVe Skin Renewing Collection! 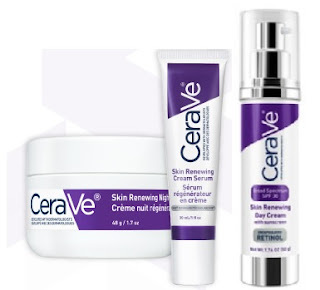 Replenish the skin barrier and reveal brighter and radiant-looking skin with CeraVe Skin Renewing. The collection contains a gentle-on-the-skin formula of hyauronic acid and 3 essential cerimides to help restore the skin and deliver 24 hours of hydration. Skin Renewing Day Cream SPF 30 - 50g - $24.99 - a light, fragrance-free cream designed to smooth fine lines and skin texture with a formula containing 1% encapsulated retinol - which is clinically shown not to irritate the skin by stabilizing and delivering retinol gradually. Along with three essential ceramides (1, 3, 6-II) to help restore the protective skin barrier, hyaluronic acid, niacinamide (vitamin B3) and patented MVE technology to provide up to 24-hours of hydration with just1 application and it provides broad spectrum coverage protection against UVA and UVB rays with an SPF 30. I love how light but still super-moisturizing the cream feels and really appreciate the SPF build right in - remembering that just because I don't see the sun as much these days doesn't mean I shouldn't still be wearing sun protection on a daily basis and this makes it so easy to get it without have to add a second step! Skin Renewing Cream Serum - 30ml - $23.99 - a light, fragrance-free cream that dissolves into a serum on application and helps reduce the appearance of fine lines and wrinkles with a formula containing 1% encapsulated retinol - which is clinically shown not to irritate the skin by stabilizing and delivering retinol gradually. Along with three essential ceramides (1, 3, 6-II) to help restore the protective skin barrier, hyaluronic acid, niacinamide (vitamin B3) and patented MVE technology to provide up to 24-hours of hydration with just1 application to revitalize skin for a radiant appearance. Skin Renewing Night Cream - 48g - $23.99 - a rich and creamy night cream designed to work with the circadian rhythm of the skin, when it is most receptive to treatment and renewal, and less exposed to environmental elements, to soften and renew the look of tired looking skin overnight. The formula also contains a biomimetic peptide complex that helps improve skin turnover while sleeping to support skin renewal and elasticity and wake up to radiant skin. Available at Shoppers Drug Mart, Rexall/Pharma Plus, London Drugs, Pharmaprix, Jean Coutu and Uniprix stores across Canada.